NASA has to make a difficult choice in the coming months. It’s easy to talk about humanity’s role in deep space exploration, but it’s another thing to actually figure out the logistics of the endeavor. One of the greatest risks involved in human space exploration is the risk of radiation. While the Earth and Sun do pose some radiation risk to our astronauts, the greatest source of trouble comes from outer space and is known as galactic cosmic radiation, ancient waves emanating from supernovas of the past. NASA astronauts are listed as “radiation workers” by the Occupational Safety and Health Administration (OSHA). 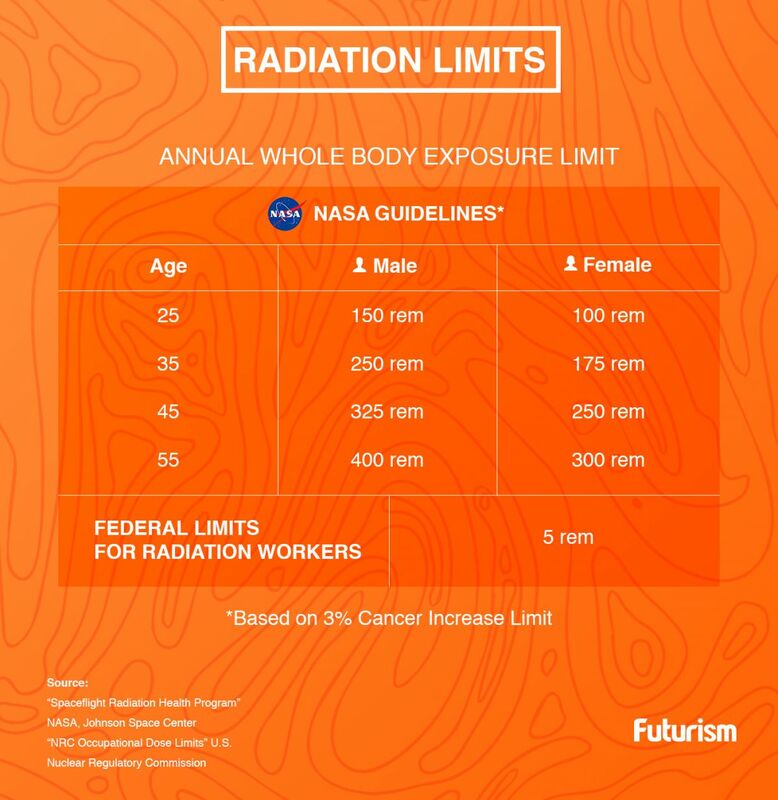 In accordance with NASA, OSHA has worked to establish the ALARA Principle, meaning that NASA keeps radiation exposure “as low as reasonably achievable.” With this in mind, OSHA waived the terrestrial radiation requirements for NASA, having the Office of the Chief Health and Medical Officer set the limit. This lead to the current protocol that ensures that astronauts aren’t exposed to radiation that will increase their risk of death from cancer by more than 3 percent. But if it’s a trip to Mars that we’re talking about, these low-Earth orbit standards will be modified to fit the expedition. While NASA has learned a lot with previous research into the long-term effects of living in space, the space agency still has a ton of data to understand, and even more ethical gray areas to define. When on the International Space Station, astronauts are exposed to ten times as much radiation as on Earth. A Mars trip would up that exposure to 100 times more than on Earth. NASA has begun to study the effects of long-term exposure with the help of astronaut Scott Kelly, Mark Kelly (his Earth-dwelling retiree twin), and cosmonaut Mikhail Kornienko. “For as long as there have been catalogs of health effects, radiation has been the most intractable, most severe, hardest problem to solve,” says Dan Masys, biomedical and health informaticist of the University of Washington. “Now, 20 or more years into advances in space technology and propulsion and systems and vehicles, radiation is still the deal breaker. It has never changed.” NASA is working on various means of lessening exposure to radiation, with faster rockets, better barriers between the astronauts and space, and drugs all on the table. But at the end of the day, the question isn’t about a group of brave astronauts, it’s about the future of humanity. Billionaire tech innovators like Elon Musk are lobbying for humanity’s eventual expansion in our solar system for the key reason of preserving humanity itself. In order to ensure that a single catastrophic event doesn’t spell out the end times for the only life we know to exist in the universe, we must push it forward, or as Musk suggests: establish a colony of 1 million people on Mars as soon as we feasibly can.